Q: My business is on a busy street. I seem to get most of my new business from referrals so it seems to me that I do not really need to invest a lot of money in a big sign. My budget is limited and I think my marketing dollar would go further elsewhere. But where? A: I think you might be missing a golden opportunity. Sure, right now you may be getting most of your new clientele from word of mouth, but just consider how much more business you might get if in fact you did have a big, bold sign? Your question reminded me that just last week I went into a business I had never frequented before, although I had driven past it many times. Now, why did I finally go in? Because previously, I had no need for what they sold (pet supplies, we have a new puppy.) But now I did, and when the time came for me to choose a company to give my business to, I chose them. Why? Although they have a big, friendly sign, I usually never even noticed it. Except that obviously I did, subconsciously even. And when I needed some puppy supplies, that business was top of mind because of that sign. So let me suggest that one of the first and main benefits of having a great sign is that it creates consistent branding; every time someone drives by your business and sees your sign, you get remembered just a little more, a little deeper. Think about fast food restaurants – McDonald’s for instance. They always have big, bold signs, right? In fact, McDonald’s spends, on average, $40,000 on signage for every store. Why? Because studies have shown that that $40,000 can generate up to $600,000 in sales. 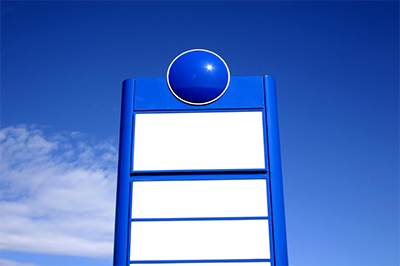 A recent survey (over 10 years) of businesses who had installed a new sign looked at the source of new customers. 45% of those new customers said they came into the business for the first time because of the sign. So how many people drive by your business every day? If you had a great sign, that’s how many people would take note of your business on some level, and many just might need what you sell. You can nab your share of them, just like the pet supply store got me, but only if you have a powerful sign. You will notice that each sign conveys a benefit to the consumer, simply. I think that is key. You may also want to add your phone number or URL, but the need for more than that is questionable. Remember, time is short. People drive by quickly. Sometimes when I see a sign with tons of info I wonder who the owner thinks will take the time, or have the interest, to read it all. Getting that valuable sign is a matter of locating and working with a good sign company. They will help you analyze your building and needs, understand the potential revenue you might generate, discuss legal and zoning issues, get the permits, and help design and then install the sign. Obviously, price is important when choosing a sign and sign company, but it should not be the driving consideration. The profit you can make should be. Today’s tip: One last thing to consider: Sure, a five figure sign sounds like a lot, but how long will it last? Spending $10,000 on a sign that will last, say, 10 years sounds might just be a bargain. Have a question about business signs? Connect with a SCORE mentor online or in your community today!